I love Vichy products. I have been using them for a while now, and I love the way they make my skin feel, plus I love that since I started using them, I get asked if I am really a mom of 2 tweenage boys! Recently, Vichy launched a new product called Mineral 89. 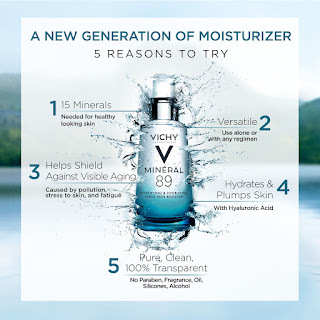 As the #1 anti-aging brand in European pharmacies, Vichy Laboratoires continues to evolve with the launch of their latest innovation, Mineral 89 Hyaluronic Acid Face Moisturizer. A true breakthrough in the skincare category, Mineral 89 is a new generation of face moisturizer. It is comprised of just 11 ingredients and acts as a fortifying and hydrating daily skin booster, further showcasing Vichy's commitment to providing pure, yet potent, formulas to help maintain skin health. Mineral 89 is so versatile that it can be used as a standalone moisturizer or layered and added to any existing skin routine. At $29.50, it is available for purchase at VichyUSA.com, Amazon.com, and select CVS, Walgreens, Duane Read, Target, Ulta & Rite Aid stores.